When you’re ready to start your next oil painting, pick up Shiva® Artist’s Paintstiks® instead of a brush. Ideal for sketching and outlining, Paintstik Oil Colors are refined linseed oil blended with a quality pigment and solidified into a convenient stick form. Artist’s Paintstiks can be spread or blended and used in conjunction with conventional oil paint. There are no unpleasant odors or fumes, so you can paint virtually anywhere, at any time, on almost any surface from paper to panel to fabric. Artist’s Paintstiks are “self-sealing.” That is, they form a protective film so the color won’t rub off or dry out. Yet they always stay moist and fresh, providing an indefinite shelf life because they reseal in 24 hours. This film is easily removed by peeling it away with a paper towel, or rubbing it off gently. It can also be removed by carefully paring it with a knife (it can also be sharpened to a point in this manner). When the stick has begun to wear to the edge of the sleeve, simply loosen the sleeve from the oil stick at the seam, open the sleeve and push the stick forward. Press the sleeve around the oil stick again and repeat the peelingprocess as needed. 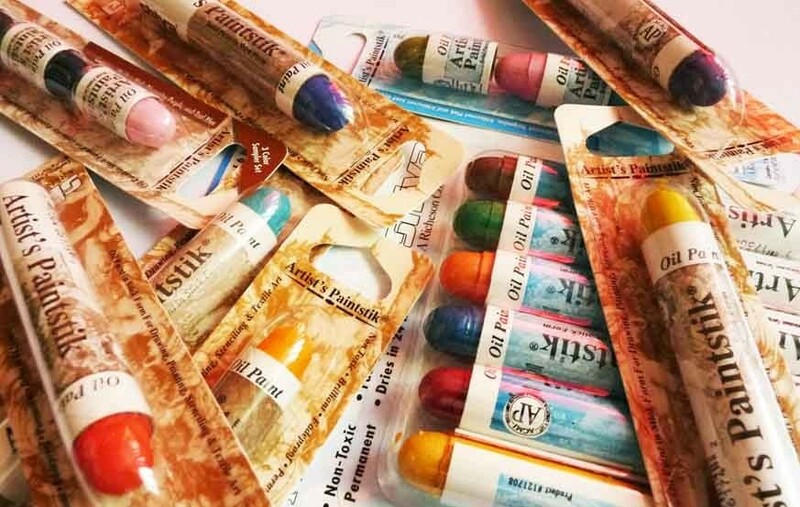 Remember that Artist’s Paintstik Oil Colors are oil color, the same as tube oils, so all the same techniques, mediums and surfaces can be used including varnishes. Paintstiks areavailable in 51 Professional Colors, 16Iridescents and 12 Student Colors.